First, a little disclaimer. 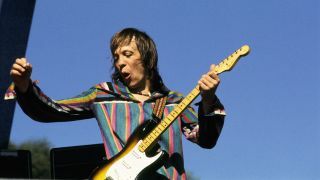 While heavily inspired by Robin Trower (especially his playing on Day Of The Eagle), I make no claim to have absolutely ‘nailed’ his style. Only he can do that. However, what I have done is dial up a Uni-Vibe simulation, plugged into the studio AC15, cranked the volume and given it my best shot! You’ll find it’s essential to hit the distorted amp/pedal after adding the Uni-Vibe rather than before, as adding the effect afterwards gives a much more ‘hi-fi’, less authentic effect. Using the middle pickup and some amp gain, these ideas are designed to get you in the ballpark if you’ve ever fancied having a go at emulating Robin’s style. First coming to prominence as a member of Procol Harum, Robin went solo in 1973, quickly becoming a major concert draw with his power trio, featuring drummer Bill Lordan and the epic talents of vocalist/ bassist James Dewar. This format - and Robin’s funky, flamboyant soloing - prompted many to compare him with Jimi Hendrix. High praise indeed, but entirely justified, certainly in the mind of prog legend Robert Fripp, who said watching Robin play had “saved his life”, later taking lessons from him in the early 1980s. The five examples are basically my whole solo cut into chunks. Key technical points to watch are maintaining a positive attack on the strings, pitching of string bends, and keeping the phrasing as fluid as possible. Robin favours legato over picked phrases most of the time, which combines well with the ‘chewy’ Uni-Vibe effect. Much of the sustain comes from playing loud, rather than using lots of drive, though a little compression can certainly help if you’re forced to play at more sensible volumes for any reason. Hope you enjoy these ideas and see you again next time! Sliding down the sixth string makes a confident, attention-grabbing start to any solo and this is no exception. There is certainly something of Hendrix in the phrasing of the second bar - but before that, be sure not to miss the quarter-tone bend that carries over from bar 2. Nothing shockingly technical here, just make sure you’re delivering with commitment and confidence - and as much volume as you can reasonably get away with. Continuing from example 1, this phrase gets a little more fiddly by virtue of the semiquaver triplets, though this shouldn’t present too much of an issue. In any case, it doesn’t hurt to ‘push and pull’ the tempo a little. Many of Robin’s most iconic solos were recorded in the days before click track or Pro Tools, so timing is as it was on the day - just like this solo! Watch for the slide into the tone-and-a-half bend in bar 2. This blues-influenced b minor pentatonic phrase jumps from shape 1 to 2 in the second bar, milking those repeated string bends. Don’t worry if there is a little extraneous noise from the B string here; it adds a little gravitas and thickness to what might otherwise become rather shrill at volume. This flurry of semiquavers - including a sneaky little triplet - forces you to choose your fretting hand fingers carefully. Run through slowly and carefully, and check out the video for hints, too. Remember, it may feel odd changing old habits, even when it’s for the better, so be prepared to spend a little more time on this one than you may have expected to at first listen.